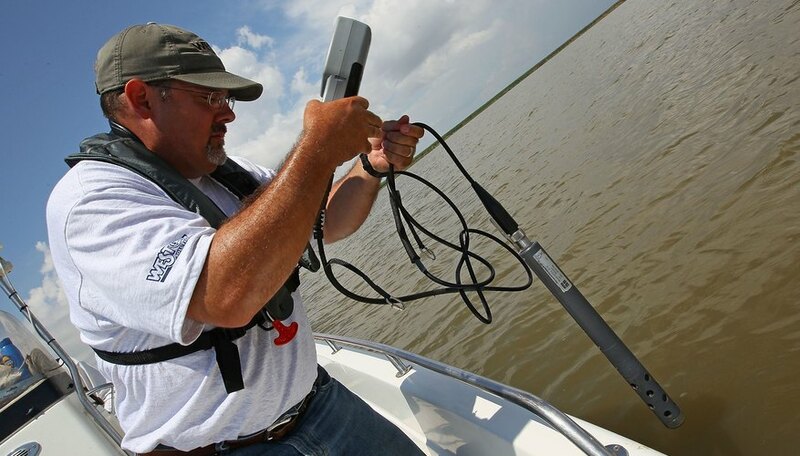 Water salinity testing is used to determine the concentration of salts dissolved in a water sample. Salinity is measured for maintenance of saltwater aquariums, to determine the suitability of water for drinking and for ecological monitoring of aquatic habitats. Salt concentration can be directly measured by evaporating a water sample and measuring the dried salts left behind (total dissolved solids, or TDS). More practical methods for estimating water salinity have been developed based on the relationships between the concentration of salt ions and electrical conductivity, density and refractive index. All water that has not been de-ionized or distilled contains some salt. Salt concentration is often described in units of parts per thousand (ppt), parts per million (ppm), milligrams per liter (mg/L) or percent. The relationship between these units is: 1 ppt = 1,000 ppm = 1000 mg/L = 0.1 percent. Salinity is also expressed in practical salinity units (psu), a measure of conductivity at a constant pressure and temperature that is about equivalent to ppt. Water is defined as freshwater when its salt concentration is less than 1,000 ppm. This is also the general limit for drinking water, although drinking water should be less than 600 ppm for palatability. Seawater's salt concentration is about 35,000 ppm. Salt water becomes more saline when water evaporates and leaves salts behind. Saline lakes and ponds, including solar salt evaporation ponds used for the commercial production of salt, can reach salinity levels up to the point of saturation (about 264,000 ppm, depending on temperature). The electrical conductivity of water is proportional to its concentration of electrically conductive salt ions. Conductivity, the amount of electrical current that can pass through the water, is easily measured with a hand-held device called a conductivity probe or meter. Conductivity then can be converted to salinity if temperature and pressure are also known. Some salinity-measuring devices do this conversion but are not accurate at concentrations higher than about 70,000 ppm. Water’s density, or specific gravity, increases in proportion to its salt concentration. Temperature also affects the density of water and is needed to convert specific gravity to salinity. Specific gravity can be measured using a hydrometer, a calibrated glass tube that is designed to float in a sample of water. The depth at which the hydrometer sits at the waterline determines the specific gravity of the sample. Then a “table,” such as the one linked in the Resources section, can be used to determine water salinity. Refractometers estimate salinity by measuring the degree to which a water sample refracts light in comparison to a pure water sample. After a few drops of water are placed on the daylight plate, the salinity value can be read through the scope. Although the refractometer method is commonly used to measure water salinity, the authors of the book “Standard Methods for the Examination of Water and Wastewater" recommend using methods based on conductivity and density for precision. Tammy James has written articles about wildlife and plants since 2002. Her writing has appeared in newsletters and scientific publications including the "Journal of Coastal Research" and "Ardea." She holds a Master of Science in wildlife ecology from Oklahoma State University. James, Tammy. "Water Salinity Testing." Sciencing, https://sciencing.com/about-6626245-water-salinity-testing.html. 07 August 2017.